Former tennis great Billie Jean King has warned the men's game that it will have to "wake up" when Roger Federer and Rafael Nadal retire, as she wishes the ATP and the WTA could form one joint organisation. King was the first female player to win Wimbledon in the Open era and has long fought for equality in tennis, with her Battle of the Sexes II triumph over Bobby Riggs in 1973 boosting the women's game. But the American, a 12-time grand slam champion, remains disappointed that the ATP, the men's association, has not teamed up with the women's WTA. King, 74, believes a joint organisation would make better business sense, but she claims men's tennis is unable to recognise this in an era where, in Federer, Nadal, Novak Djokovic and Andy Murray, there are four genuine greats. "My plan A was always to have the men and women together, period," she told The Observer. "Because it's not just what we can do on the court, but also off the court to make the world a better place. "We also have more power together than divided. It's simple. We're so much more powerful together. "If you are in business and you own a tournament where the men and women are together, and you want to sell your tournament, it's worth so much more than having a single-gender tournament. It's just better business. "I don't see it [happening]. The guys don't want to share. They think we're in the way, 'Get out of here.' They don't think we have any clout. "I think they'll have to wake up again because they've had a golden era, especially with Federer and Nadal and Djokovic and Murray. Are you kidding - the four of them? Amazing. "That's not going to happen every generation. 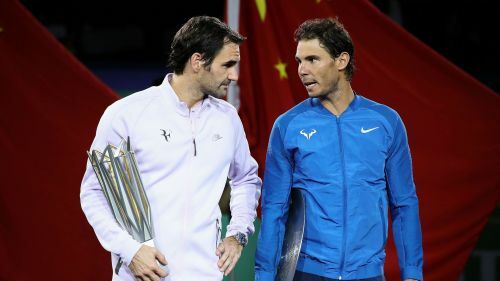 We'll still have one or two maybe, a lot of young guys coming up who are interesting, but they're not Federer or Nadal."